Happy Valentine’s Day–a day to spend in celebration of that special something that you can’t quite define in words but can cite a thousand examples between the two of you. Our HVD dinner, brightened with fresh tulips, consisted of a homemade lobster macaroni-and-cheese that armies would fight for, delicious asparagus in a lemon and burnt butter sauce, and the best company possible. A molten chocolate cake – you see it in the photo here – was a featured dessert that my wife could sell in a high=end supermarket. It was a great finish to an evening that began with the Veuve Clicquot Brut Yellow Label, one of our absolute favorites, and plenty of phone calls to our favorite people. Hoping your celebrations and your bubbly were as good! 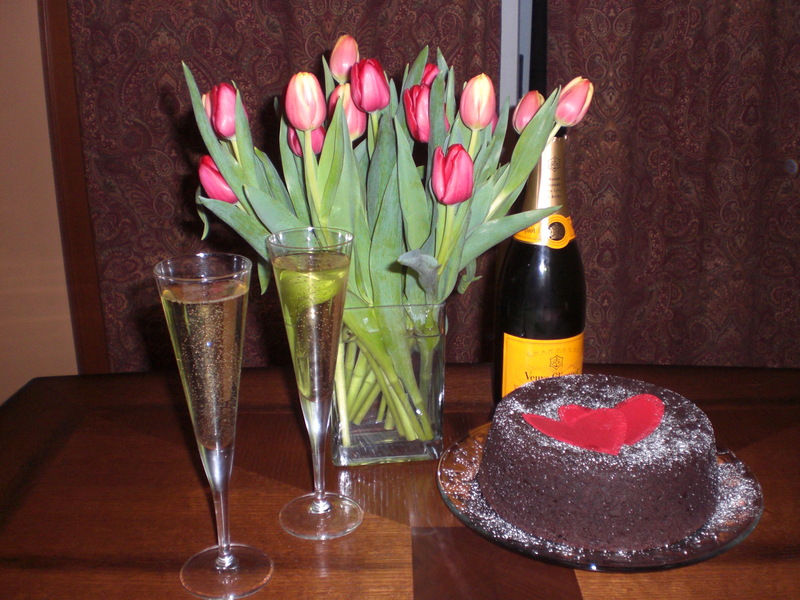 Veuve Cliquot Yellow Label, of Champagne, France, accompanying our fresh tulips, chocolate cake, and lobster macaroni-and-chees dinner. This entry was posted in Champagne and tagged France.